When you are throwing a party, there is often no time to drink something leisurely. 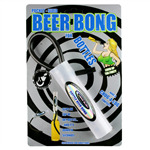 That is where the Bottle Bong comes in! If you want to drink as much as possible, in as little time as possible, just clip the Bottle Bong to the top of the beer bottle and slurp away! When you are using the Head Rush Bottle Bong, your drink will be gone in a matter of seconds (depending how quick you can drink), so get it down your neck and party on!